AccuTran Global is a virtual services company that has been in existence since 2002. They are based in Vancouver, but they hire people to work from home doing transcription throughout North America. Most of the work done here involves transcribing financial conference calls and interviews. 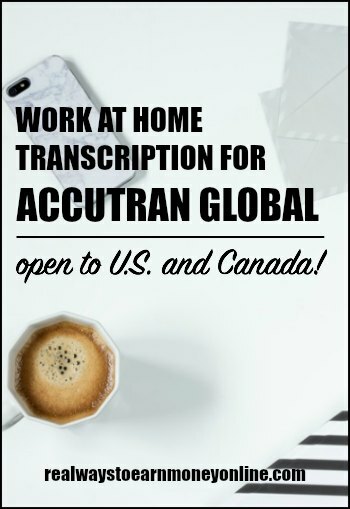 How much does AccuTran Global pay for transcription? The company is very open about the rate of pay. It's per word and ranges from a starting base rate of $0.005/word for a beginner on basic audio, to their top rate of $0.0066 for difficult and/or foreign audio done by a senior transcriber. They also give a 20 percent bonus for foreign-calls from non-English speaking countries and 20 percent bonuses for calls containing a lot of technical jargon. If you are with them for six months and earn $2,000, they will then reimburse you $50 for your training time. Payments are made on the 15th of every month via check or wire transfer for work done the previous month. Does AccuTran Global hire beginners? They prefer to hire people with experience, but anyone can download and take their audio and questionnaire tests. Even without experience, you may be able to get in if you do well enough on the test. If you know absolutely nothing about transcription, I'd recommend educating yourself a bit before attempting the test to give yourself a better chance of passing. A lot of beginners actually start out at places like Quicktate and Scribie where, although the pay is on the low end, it can give you some familiarity with how transcription works. Are you hired as an IC or an independent contractor? AccuTran Global will hire you as an independent contractor, not an employee. How busy is AccuTran Global? So, as is the case with just about any work at home job, if you are hired here, you should have some other jobs to fall back on when the workload is slim to none. Can you log in and work whenever you want? You can access the files to transcribe via their website, and they use AOL instant messaging to communicate with you. Additionally, they ask that you let them know week to week when you'll be available and they will try to schedule work for you around that. AccuTran Global does not require that you purchase any equipment to get started as long as you are a PC user. They provide all the software you'll need free of charge. However, they do recommend having an up-to-date PC and if you happen to be a Mac user, you'll need to get the Express Scribe software. They recommend a foot pedal for all workers because it can help you do the work faster, which would ultimately mean that you'd earn more money, but you don't need it to get started. However, I did read on the FAQ page that they are now requiring all their new transcribers to use foot pedals by the time they start the second peak season of work for the company. You also need some headphones and high-speed internet, but they say that if you have dial-up, you can still do the work. Does the company hire outside the U.S.? Yes, as stated above they are based out of Canada, so Canadians are welcome to apply. You have to take their audio test and questionnaire and submit it to them. You'll only hear back if they think you are qualified to do the work. Yes, they also have editing and reviewing positions. You can possibly move up into these after you have some experience with the transcription. These jobs require going back over the transcriber's work and checking for errors, listening to the audio again, and also doing some more extensive research. AccuTran Global also hires real-time writers and scopists, but the info for these positions is not provided. If you're interested, you'll need to email them and ask about it. I'm actually very impressed with the amount of information this company provides directly on their website about the job. It was helpful to me when doing the research. However, there are other details that I may not have covered. Therefore, if you're seriously considering this company, please read over those here. I'm not really finding any complaints/red flags on this company. Everyone seems to be saying they are pleasant to work for and pay on time. If you would be interested in applying, you can go here to view the Jobs page. Good luck! A foot pedal allows you to pause, rewind, and forward using your foot..as opposed to manually. You can transcribe about 50% faster with a foot pedal. Just a question for those in the know, what exactly is the function of a foot pedal? Hi, how can I apply? Thanks. I have been thinking for sometime now that i should start with this company. I am just not fully confident in my skills yet. I was wondering if you knew or if anyone else knew if they still offer training.